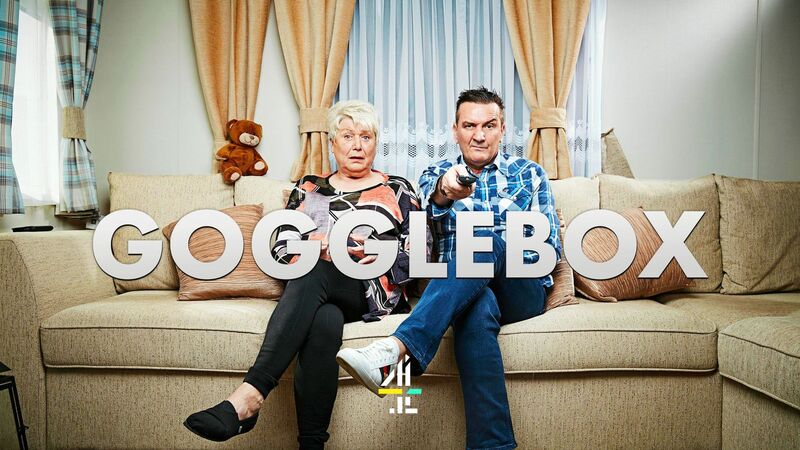 Here's where to watch every episode of Gogglebox season 9. Mouseover or tap an episode to see where to stream it. Click or tap the play icon to stream it on the best available service. Episode 1 Feb 24, 2017 What do Britain's favourite TV viewers think of The Jump, Dragons' Den, Death in Paradise, Jon Richardson: How to Survive the End of the World and SS-GB? Episode 2 Mar 3, 2017 Britain's favourite viewers on: Mary Berry Everyday, The Nightly Show, The Secret Life of the Zoo, Little Big Shots, Incredible Medicine, The Secret Chef - and the Oscars and squirrels on the News. Episode 3 Mar 10, 2017 What do Britain's favourite opinionated TV viewers think of The Voice, Mutiny, Mastermind, The Replacement, Five Gold Rings, Top Gear and the News? Episode 4 Mar 17, 2017 Including Schofield's South African Adventure, Saturday Night Takeaway, Dogs Behaving Badly, Robot Wars, University Challenge, The Replacement, The Great Pottery Throw Down and more. Episode 5 Mar 24, 2017 What do Britain's favourite viewers think of The Voice, Three Wives, One Husband, Broadchurch, Star Wars: The Empire Strikes Back, Rivers with Jeremy Paxman, and Dame Vera Lynn: Happy 100th Birthday? Episode 6 Mar 31, 2017 What do Britain's favourite viewers think of Line of Duty, University Challenge, Rio Ferdinand: Being Mum and Dad, Comic Relief, Broadchurch, One Night with my Ex and All Round to Mrs Brown's? Episode 7 Apr 7, 2017 What do Britain's favourite viewers think of Kitchen 999: Emergency Chefs, the final of The Voice, Alone with the In-Laws, Line of Duty, Life Story, One Born Every Minute and the News? Episode 8 Apr 14, 2017 What do Britain's favourite viewers think of Mary Berry's Easter Feast, Saturday Night Takeaway, University Challenge, Big Little Lies, The Toilet: An Unspoken History and The Dog with an IQ of 102? Episode 9 Apr 21, 2017 What do Britain's favourite viewers think of Britain's Got Talent, Nature's Weirdest Event, Dr Who, First Dates, Culinary Genius, and the News? Episode 10 Apr 28, 2017 What do Britain's favourite viewers think of Bigheads, Britain's Got Talent, Line of Duty, Little Boy Blue, Joanna Lumley's Postcards, The Island with Bear Grylls, and the News? Episode 11 May 5, 2017 What do Britain's favourite viewers think of E4's Tattoo Artist of the Year, Antiques Roadshow, The Supervet, Britain's Got Talent, The Island with Bear Grylls, Speed and the News? Episode 12 May 12, 2017 Including Tonight at the London Palladium, Theresa May's appearance on The One Show, Britain's Got Talent, King Charles III, First Dates, and Amazing Hotels: Life Beyond the Lobby. Episode 13 May 19, 2017 What do Britain's favourite viewers think of The Eurovision Song Contest, The Island with Bear Grylls, Nature's Miniature Miracles, Three Girls, Britain's Got Talent and the News? Episode 14 May 26, 2017 Including Twin Peaks, Britain's Got Talent, First Dates, Mexico: Earth's Festival of Life, Andrew Neil's interview with Theresa May, and the News. Episode 15 Jun 2, 2017 Including Andrew Neil with Jeremy Corbyn, Green's and SNP's Party Election Broadcasts, Your Face or Mine, Great British Skinny Dip, and the News.